We are currently helping a membership organization dedicated to improving women’s health find an amazing candidate to lead their CMS platform strategy and improve their digital presence. Or, perhaps you’d be interested in learning about dozens of other marketing, communications, digital and PR jobs in DC that we’re currently recruiting for. >> Visit Our Jobs Board today – and check back often, because new jobs are added all the time. 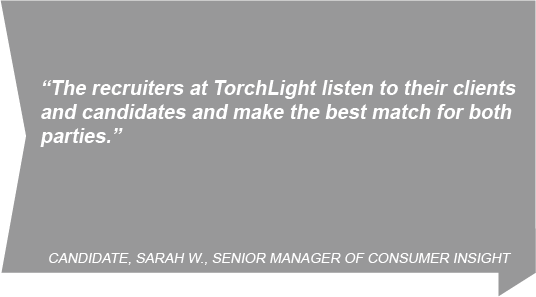 See for yourself why TorchLight is the Washington region’s #1 marketing recruiting agency. We are passionate about matching great companies and good people. Learn more today! ‹ 8 Skills Every DC Marketer Must Have…How Do You Stack Up?